The Jequitinhonha Valley (in Minas Gerais, Brazil), once a prosperous region whose economy was driven by the gold mines, today is one of the poorest areas in Brazil. Poor only from an economic perspective – very rich in culture and humanity. The inhabitants of the valley are mainly women, known as “the widows with alive husbands”. In fact, due to lack of employment in the region, the men have been forced to move to the cities looking for a job, leaving their women and children behind. The women of the valley were able to collaboratively rebuild the economic fabric of the area, transforming themselves into the living propellers of hope, empowerment and emancipation for themselves and for many others in the region. In 1994 a group of eight women from the village Campo Buruti decided to gather their energy and start working together. On a piece of land received as a gift, they build the headquarter of the Craft Association. Their collective journey had started. They had to fight against many adverse conditions, the risk of poverty but also against others’ scepticism; but full of courage and passion – and plenty of hard work – they were able to create a tradition which has turned the source of their problems into the solution for their future. The soil of the dry and arid land – the reason why men had to abandon their lives and wives – is now transformed into splendid handicrafts. 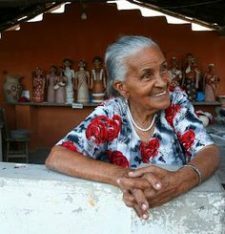 The art of working the clay has been handed down from mothers to daughters for generations and now represents both their struggle and their achievements. The pieces of handicraft are taken to the closest town, to be exchanged for food – the community’s main source of subsistence. Each unique piece tells the story of the woman who made it, her personal journey, daily life experiences and dreams. 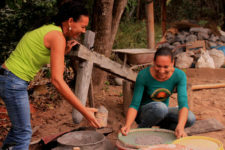 Today, 40 women form the group of artisans, and with their work they offer visitors and tourists a unique opportunity to connect with their way of live. The community-based tourism (CBT) experience which exists today and is offered through social enterprise Vivejar developed over several years. 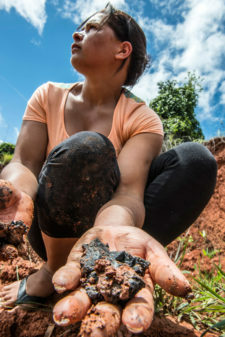 Starting in 2006 with the support of Turismo Solidário, a social programme of the State Government of Minas Gerais, it was paused but restarted again in 2011, this time with the support of Raízes Desenvolvimento Sustentável. This organisation carried on the work that the women had begun by providing them with further training, helping them to organise their product offering and teaching them new technical skills. Eventually the community coalesced their various products and experiences into a tour, which is now offered to domestic and international visitors. The story of these women is one of resistance, resilience, inner strength and collaboration. The CBT experience available to tourists today represents for them an opportunity to share this story with other people, while boosting the local economy. As one of the women put it, producing art is not only about creating a source of income, but it is also therapy and, most importantly, provides them the independence to choose how to live their lives. They have created opportunities for themselves that their husbands never had.